If you’ve heard those words, here’s the scoop: When you host a qualifying Scentsy party, you can get all the Scentsy you LOVE at half-price or free (as in, NO dollars spent on the warmer or diffuser you’ve had your eye on). If you’re not quite sure what it means to host a party, don’t let that hold you back! Let’s run through everything you need to know. DOES NOT mean = awkward conversation and pantyhose and a sales pitch. DOES mean = literally whatever you want it to be. Round up friends and family and host a party wherever you like to hang out. Your Consultant will be there to handle everything. Your Consultant will give you catalogs, order forms and a small basket or bag of our fragrance testers, and you take it from there. Leave them on your desk at work for when coworkers pop by or take them to your kid’s soccer game. It’s easy to share your favorite products with SO MANY people! You’re already on Facebook, so host an online party to connect with friends from all over. You could even create your own party-hybrid, where you meet up with some friends and your Consultant at a coffee shop to test out all the fragrances in the Scentsy catalog, then share a party link on Facebook with anyone who couldn’t be there! Your Consultant can help you blend up the perfect strategy for getting the most possible rewards. To that, we first say: The quality of our fragrance products can’t be beat. They last longer and smell oh-so-much better than the knockoffs. Second, for anyone who isn’t familiar with network marketing (at Scentsy, we call it social selling! ), here’s the idea: A company like Scentsy, with a great product line and an incredible team, invites passionate fans to join up as sales Consultants for a super-small investment, so they can run their own business on their own time, without the financial constraints of managing inventory and all the other major expenses that come with business ownership. So when you host a party, you’re also supporting a friend’s small business! 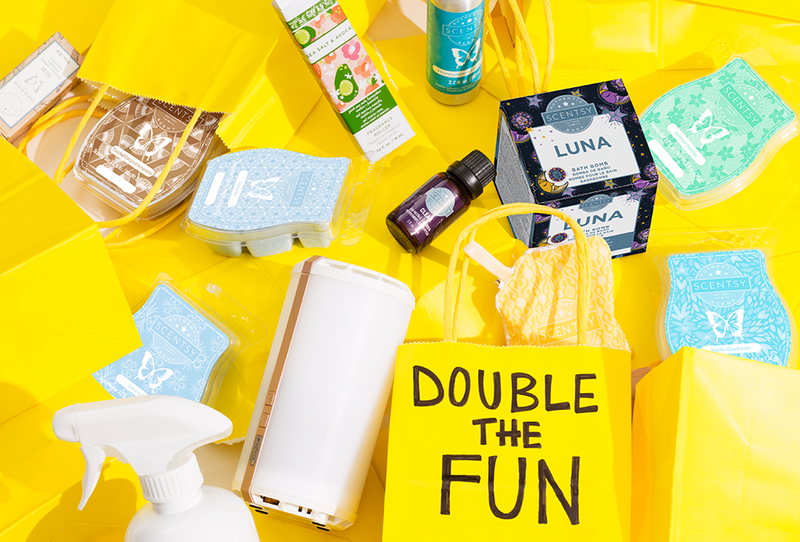 It’s an especially great way to shop Scentsy this month, because hosting a party in January means you earn DOUBLE half-price Host Rewards. Flexibility: Party your way, wherever you want. Ease: Your Consultant handles all the details. You just provide the guest list! Superior products: For your superior taste. Support: You’re helping a friend reach her goals! Sounds pretty great, right? Call your Consultant to get your party on the calendar, or find one at scentsy.com.